On Sunday March 17th, many Irish people and their friends celebrated St. Patrick’s Day. But how many? I had no idea that according to the U.S. Census, there are 34.5 million Americans who list their heritage as either primarily or partially Irish. That number is seven times larger than the population of Ireland itself (4,784,000). Irish is the second most common ancestry among Americans, falling just behind German. I found this information in an article from “The Washington Post” dated March 17, 2013. 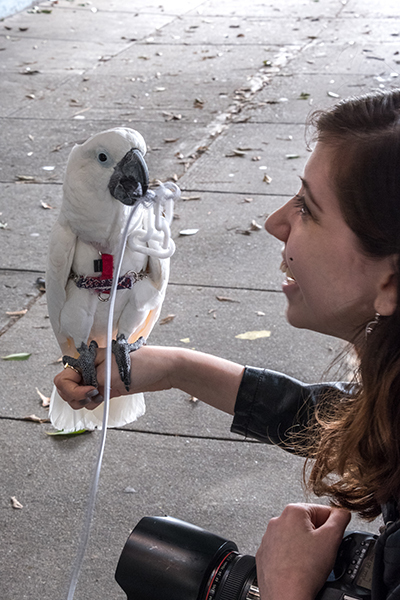 The reason for my quest has to do with the work for my next photo-story book, “42 Encounters with Pairs in San Francisco”. 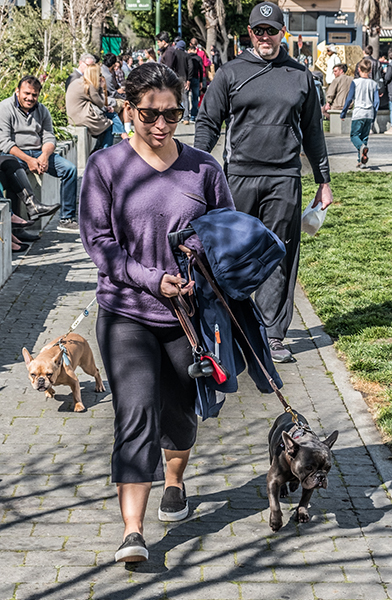 Though I have enough images to finish the book, last week I decided to go to Downtown to photograph the St. Patrick’s Parade, just in case I could capture some new images. 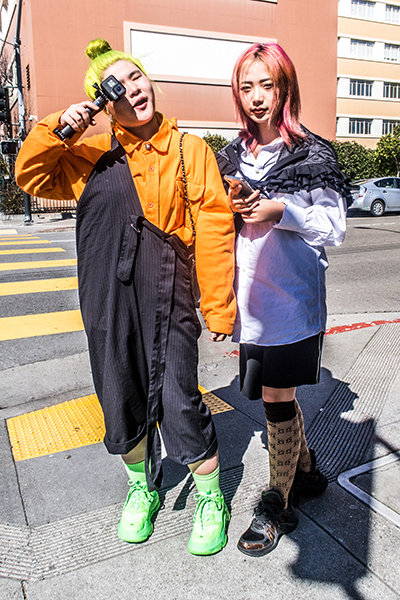 I usually take the Muni train at West Portal, down the street from our house, but it was a weekend and I did not want to leave Elfa and Max at home, despite the fact that when I photograph, I prefer to be by myself, but this would go against the Kaizen of our relationship. Driving by car became an issue when as we approached Civic Center, where the Parade ended. The traffic was at a complete stop. Our solution was to turn into the Hayes Valley area. We were lucky to find parking and blended into the crowd of young people, who were there to have a good time. In spite of the proximity to Civic Center, I did not see many green shirts or any other signs pertaining to the event. My next question was, how many people of Irish decent reside in San Francisco? Online I found a very interesting article written by Mary McCloy titled, “The Irish in San Francisco”. 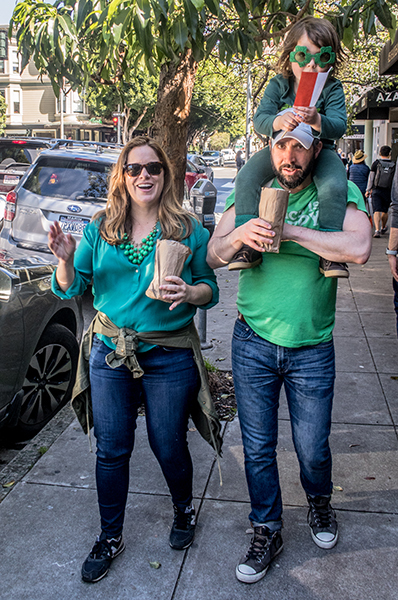 I could not find the exact number of San Franciscans of Irish decent, but wandering through the streets and seeing the faces of people who could be from any parts of the world spending time together, I realized that in today’s egalitarian San Francisco, with a total populationof 884,363 (as last tallied in 2017), does it really matter? In his San Francisco Chronicle column on Sunday March 17, 2019, our former mayor Willie Brown wrote about the Triple I, the Irish-Israeli-Italian Social Club. Over the last fifty-three years, the group has been celebrating major holidays together (like St. Patrick’s Day). San Francisco’s population is well known for being a melting pot. P.S. These four images are of the different pairs that I encountered that day. The image of a dog loving pair is just a reminder that if you need a special gift for a special person, “42 Encounters with Dog Lovers“ is available on Amazon.com. Enjoy & Share with a Friend.